Dr. Dawson is a school leader specializing organizational leadership and leadership practices. She earned her Ed.D. from the University of Pennsylvania’s Graduate School of Education. She has also studied at Stanford University’s School of Business on Leadership and Change. For the last 20 years, she has held leadership positions and led school reform at all levels of public schools. Her experience includes supervising large, diverse staffs, managing resources and yearly budget in excess of twenty million dollars, and developing business partnerships within the communities in which the schools resided. 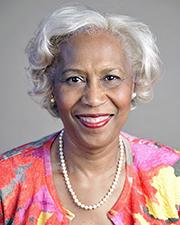 Dr. Dawson, over a six-year period, studied leadership practices as a part of a project sponsored by the Wallenberg Foundation, where she participated in leadership seminars at Cambridge University, Cambridge, England; University of Innsbruck, Innsbruck, Austria; Danish University, Copenhagen, Denmark and; University of Athens, Athens, Greece and was a part of the International Conference for School Improvement and Effectiveness in Sydney, Australia. Ed.D. (Educational Organization and Leadership) University of Pennsylvania, 2007. M.Ed. (Social Studies Curriculum and Instruction) Temple University, 1972.